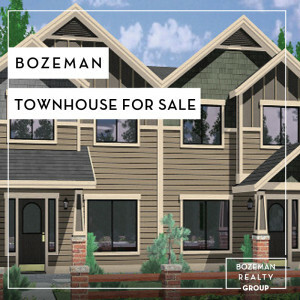 Current Bozeman, MT Townhouse and Townhomes for sale. To search additional multi-unit properties currently available for sale, please refine your search by selecting the drop-down filters below. Common searches include Bozeman Duplex, Bozeman Triplex, Bozeman Fourplex, Bozeman Condominium, and Bozeman Detached Condo – No Shared Wall. Luxury Townhome living at its finest! This brand-new, ultra-functional floor plan provides abundant space with over 2600 sq feet, all on one level. Three covered patios are surrounded by mature landscaping and look on to Black Bull’s award-winning golf course beyond. The Master Suite is on one side of the home and boasts a sitting area, private patio access, his and her closets, and a spa-like bathroom with walk-in shower and double sinks. The living, kitchen and dining areas are open and airy and include a separate bar with wine cooler, stainless appliances, large walk-in pantry and gas fireplace. Two additional patios are accessed from the dining and living areas. The guest wing has two, large guest bedrooms with walk-in closets, each with their own en-suite bath for ultimate privacy. A large ½ bath for visitors, laundry area, quartz counter tops, A/C and a heated double-car garage round out the features of this beautiful home. A rare opportunity to own a Block M Townhome. Tons of natural light permeates this 3-story modern industrial custom home. Enjoy the stunning views of the Bridgers from the huge windows on the upper level or the rooftop patio. Never worry about street parking with an attached 2-car garage! Amazing walnut kitchen island, white pine floors throughout, and loaded with modern finishes. Lower level has a private entrance and separate meter to allow the possibility of renting. Just a couple of blocks from the heart of Downtown Bozeman and a block away from Beall Park. Don't let this unbelievable home slip through your fingers! Convenient to shopping, schools and the Regional Park, this 3 bedroom townhouse will delight you. A cozy gathering space welcomes you to a warm gas fireplace and abundant light. The spacious kitchen has loads of cabinets, engineered hardwood floors and connected dining area. With Bridger views, the fenced back yard is a wonderful place for summer entertaining. Retreat to the huge master suite with space for a seating area and access to sunset views from the balcony. The master bath is exceptional, with soaking tub, large walk in shower, and dual sinks and the bonus area is perfect for music or media. You don't usually see this many amenities in a townhouse--especially at this price. Short notice is usually accommodated for showings. Don't miss this adorable townhome on an extra large lot in Baxter Square. The nearly 2000s/f open concept floor plan is highlighted by a gas fireplace, laminate wood flooring, granite counter tops, tile backsplash in kitchen , and stainless appliances. Great master with walk-in closet and huge tiled bath with tiled walk-in shower, heated floors, and double vanities. Big mud room on the main level off garage means extra storage, and the separate laundry upstairs offers convenience to bedrooms. Fenced back yard, large side yard for gardening.